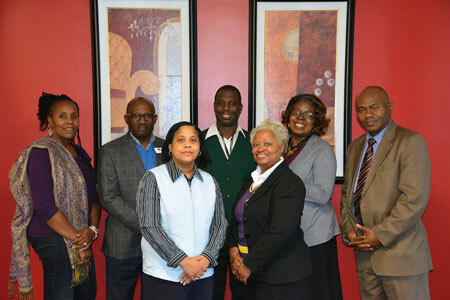 On April 29, 2014, a group of National Council on Black American Affairs (NCBAA) Leadership Development Institute (LDI) graduates convened a meeting to connect and provide updates to their respective careers. A spirited discussion ensued as many reflected on their experiences and the impact of attending the LDI. As a result of the exchange, all of the attendees including Dr. Carolyn Anderson, former Interim President for Baltimore City Community College, unanimously concurred with the idea to keep the group intact and to investigate chartering a chapter of NCBAA-Northeast Region. The idea of forming a chapter was fully supported by the new College President, Dr. Gordon F. May. Since the initial meeting, 15 scholars met to prepare the chapter proposal document for approval by the Northeast Region-NCBAA board of directors, to formulate a mission statement, and to elect the charter officers. The LDI graduates agreed on the name, “Baltimore Metropolitan Chapter (BMC)” of the NCBAA – Northeast Region. Many felt that it was important to have a chapter name that would reflect the group’s desire to solicit participation from professionals beyond BCCC’s campus. At the July 2014 board meeting, the NCBAA-Northeast region Board of Directors approved the proposal to establish the Baltimore Metropolitan Chapter as its first regional chapter. Baltimore Metropolitan Chapter’s mission is to support the mission and values of the NCBAA with an emphasis towards promoting awareness and membership from the local geographic area. We are committed to serving as an extension of NCBAA”s regional and national efforts through mentorship, institutional succession planning, professional development, information sharing and partnerships. The group elected Ms. Sheryl Nelson, President, Dr. Daphne Snowden, Secretary, and Ms. Wendy Harris, Treasurer. To continue support for the Leadership Development Institute, the BMC’s first undertaking was to facilitate and recommend to the College President attendees for the 2014 LDI. Mr. Charles Wilson and Dr. Lesly Brown the group’s two newest members returned to BCCC appreciative and enlightened by the experience. BMC’s current 16 members include LDI attendees dating back to the 2003 Inaugural Class to present. The November 2014 meeting agenda will focus on planning a formal chartering event, establishment of committees, identifying goals for the remainder of the fiscal year, participation in the NCBAA-Northeast Region Spring 2015 Conference and strategies for communicating with the region. The Baltimore Metropolitan Chapter is looking forward to expanding awareness of NCBAA, as well as providing professional development and networking opportunities for area community college professionals. Disclaimer: The information contained in this website is for general information purposes. Although NCBAA Northeast strives to keep information on the website up-to-date and correct, we cannot guarantee that it will be so. As a result, NCBAA Northeast makes no representations or warranties of any kind, either express or implied, about the completeness, accuracy, reliability, suitability, or availability of the website itself or the information, products, or services provided on it. The viewer to the website is responsible for contacting the appropriate NCBAA Northeast official to verify information, and any reliance that the visitor to the website may place on the information, products, or services provided on the website is, therefore, strctly a his or her own risk. In no event will NCBAA be liable for any loss or damage whatsoever that may arise in connection with the use of this website. Through this website, the viewer may be able to link to other websites that are not under the control of NCBAA. The existence of these links does not suggest that NCBAA approves, recomments, or endorses the content of those websites. Non Discrimnation Statement: NCBAA Northeast prohibits discrimination against any person on the basis of race, religion, gender, color, national origin, ancestry, age, sexual orientation, marital status, physical or mental disability of otherwise qualified individuals and any other category protected by federal, State or local law. ©2019 Northeast Region of The National Council on Black American Affairs. All Rights Reserved.